The good dwarves have lost their tools (or maybe some saboteurs stole them? anyway, they're gone) and walk around the cave labyrinth (uncovering regular safe labyrinth cards) to go find them. If they manage to find them all before the saboteurs stop them by causing the rock slide (having the rock slide card be uncovered), they win. 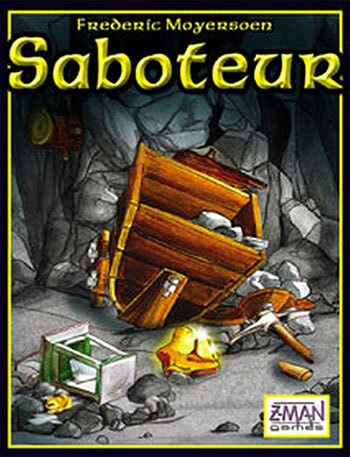 The Saboteurs win if they manage to cause the rock slide before the tools are all uncovered. As many "Labyrinth" cards as needed for the deck to equal five times the number of players. e.g., thirty cards total with six players. Note that the Saboteurs do not necessarily know who the others are! Every Round, Each player looks at their hand, shuffles it without looking again, places it face down and play begins. Each player has to choose one player and explore one of their tunnels by flipping up a face down card. Questions and discussion are strongly encouraged. When the "Rock Slide" is revealed, the game ends and the Saboteurs win! When the last Tool is revealed, the Good Team wins! Otherwise, the Headlamp is passed to the left and play continues until everyone has explored once- thus ending the Round. The cards are then reshuffled and re-dealt and play continues for at most 4 Rounds. If the last tool is not found by then, the Saboteurs win!